Many of the characters I draw have intense energy. I reference images from all over, such as cartoons, street fashion, pop culture, movies, and magazines. My renderings often strip my subjects of the confines of their previous depictions as my drawings create new lives and stories for each portrait or depiction. My subject matter will vary across genres, but often incorporates cartoon network influences regardless of the subjects previous connections. 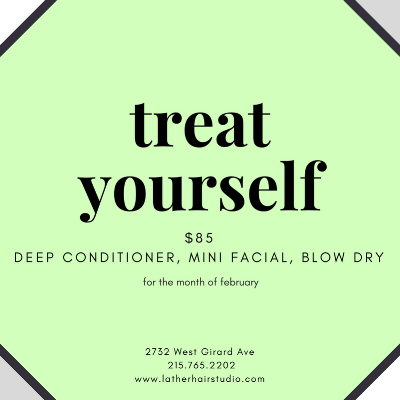 For the month of February we're offering a Lather Hair Studio and Lather Up joint special. Enjoy a deep conditioning treatment, followed by a curated mini facial, and a blow dry style to finish. This special is $85 ($100 value) from now until the end of the month. This month we'll have another installment of Style Lab. This will be the third of a series of classes dedicated to home hair care and styling. Come hang out and lets talk about hair! Class will include a demo followed by a thorough Q&A session. 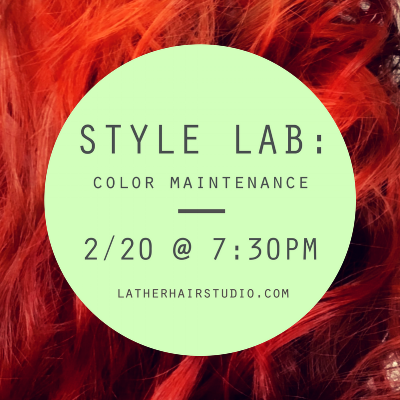 The $20 ticket price can be used towards a product of choice or future hair appointment here at Lather. Please join us at 7:30pm, class starts at 8:00pm sharp. Contact us at the shop with any questions and look out for our facebook invite. Just a reminder that Lather has made the switch to gender neutral pricing. We want our pricing to be based upon time, product, and the service above all else. We pride ourselves on not only our technical skills but our thorough consultations. If you have any questions about our pricing or happen to be working on a budget, we are hear to listen, explain and make all of your wildest hair care and skin care needs come true.